6/1/09 Update--"Burial" Scene construction cont. Still continuing on working on the burial scene. As of today, the first day of June, I'm officially behind schedule. My goal is to do a scene a month and the burial scene was suppose to be done last month. So this month I have to finish the scene and then get started on the one scene I'm not looking forward to at all--the Dinner with Nemo. But that's far ahead at this point, for now, I'm focusing on getting the burial scene done. As described in my last posting, the coral forms of Celluclay and aluminum foil were created and when they dried rock hard, I painted them in shades of dark greens and browns. I employed an old toothbrush for spattering some paint on them for variations in colors. Once the paint dried, I added some more details like ground foam, foam foliage, and miniature wire tree branches with the foliage striped off. The sand I applied is genuine ocean sand, collected from Huntington Beach. I spread the sand out and sealed and secured it with 50:50 ratio of water and glue solution. I painted a backdrop for the scene, though after some calculations I discovered that I need the backdrop to be taller, so a new one will need to be made (this time, one without a seam in the middle!). The masking tape signifies areas that will be covered with a window frame, etc. so you won't see the edges or sides of the box. I also discovered an easy way to give the whole scene a monochromatic look like the scene in the movie. I was considering blue light gels and eventually a gel over the window itself, but there was an easier and more effective way--food coloring! I did a few tests with my bubble box and a couple drops of blue food coloring in the water, and instantly the scene looked like a blue-hued-monochromatic ocean; exactly what I want! In addition to the "bubble box' the illusion of an underwater scene will be helped my a lighting effect to simulate the sun coming through the ocean surface. This was quite a problem, mainly in trying to figure out how to do it. My very first idea on how to create the effect was to have a clear tray of water with a light shining through it. A fan or an air line from one my air pumps would create turbulence in the water, creating the illusion. Even though that seemed like the natural way to do it, there would be problems if I did it that way. For one, having a 120 volt lighting hang above a tray of water is not a good idea, not to mention moisture and jumping beads of water coming from the air line towards the light doesn't help either. At this point, I was seriously considering getting one of those lighting effect projectors that are used for dances and clubs. It creates a very convincing water ripple effect projection. My only concerns were the price, how close can it focus, and it's size. So that idea was scrapped. I needed a smaller (and cheaper!) solution. My solution came when I discovered a patent for such a simple device that creates a water effect through a simple mechanism that consists of two rotating drums and a patterned film that turns. The light would shine through the two layers of film moving in opposite direction, creating the effect. Genius! This was of doing the effect was simple enough that I could build it at no cost and it wouldn't use real water! After working on a prototype and a few tests, I simplified the effect by just having two sheets of clear plastic move back and forth rapidly with a "scissor" movement to save space and the material itself (I imagine a film bending and rotating every few seconds would wear out rather quickly). I built my lighting mechanism out of K'nex parts and a lego motor, which are a whole lot cheaper than a projector! A penny is shone for scale. My original plan was to get a hold of five of them and convert each one as I aquire them. Well, I changed my mind and I only need one; I'm going to take the one I have and trick it all out with details and accessories. Then I'm going to pull all of it arms, legs, and torso apart (gruesome, I know!) and get each part molded. 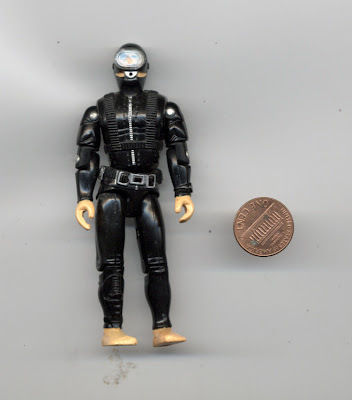 Then I can cast as many identical divers as I want without having to make a bunch of difficult parts, like the helmet, and without paying premium for eBay prices and shipping. I'll have to change a few thing like the helmet and poses and such, but this seems like the way to to go. Depending on how easy the casting process is, I might make a few more to sell--but that's for a time when I'm not behind schedule!